On his first day at work as a security guard, Steve was greeted warmly, drawing attention from passersby, including some taking selfies with him at the tony retail-residential complex he patrolled. Then he fell into the fountain. 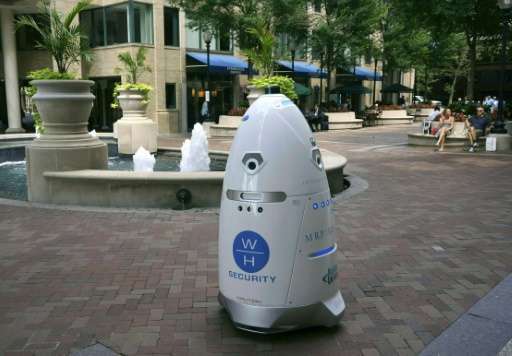 Steve was a security robot employed by the Washington Harbour center in the Georgetown district of the US capital. According to some tech watchers, robots like Steve herald a new era for intelligent machines assisting in crime prevention and law enforcement. Steve's mishap in mid-July set of a flurry of reaction on social media, with some saying the robot had "drowned" or committed suicide. But Steve turned up on Twitter to debunk the fake news, tweeting, "The reports of my death are greatly exaggerated." Still, he had to be sent back to his Silicon Valley headquarters. And he was replaced by his "sibling" Rosie, who has resumed patrols in the complex. "It's nice to have extra robot eyes on the property," she said. "There are indications this will be a great addition to the security team." 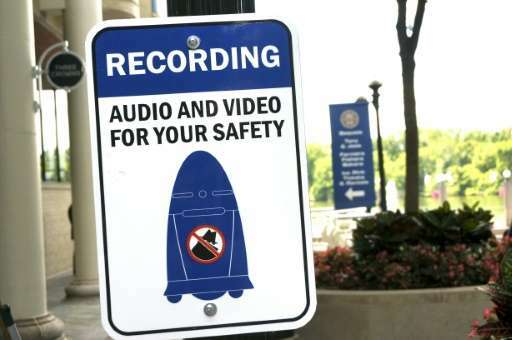 Knightscope was founded in response to the 2012 mass shooting at Sandy Hook Elementary School in Connecticut and the 2013 deadly bomb attack near the finish line of the Boston race, according to the company's website. The robots are equipped with a 360-degree camera, thermal imaging, automatic license plate recognition, directional microphones, proximity sensors and other technology. Their "anomaly detection software" is designed to determine when there is a threat, and alert appropriate authorities. 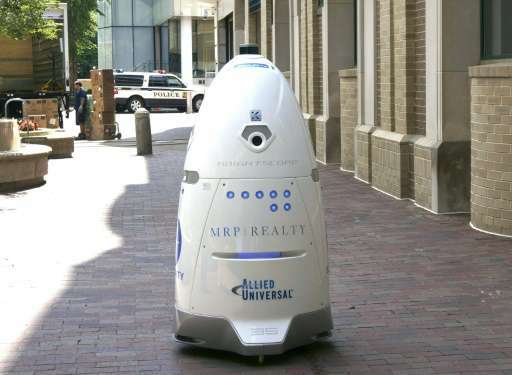 Knightscope has deployed its five-foot (1.5 meter) tall outdoor K5 robots like Steve and Rosie and the smaller indoor K3 robots at malls and other businesses under a partnership with the security firms Securitas and Allied Universal. Kightscope—which declined to comment beyond its issued statements due to a pending public share offering—expects it can take a bite out of crime and reduce security costs as well. It charges clients an average of $7 per hour, according to its regulatory filing. A small number of rivals are also entering the field. Fellow Silicon Valley startup Cobalt Robotics has begun delivering indoor security robots to businesses in California, primarily for security during nights and weekends. The robots "have the computational intelligence of an autonomous car but for indoor security," says Travis Deyle, Cobalt's co-founder and chief executive and a former engineer at Google X.
Deyle said the Cobalt robots can be deployed as a fleet in a building or complex and monitored at a control station. "They are looking for things that shouldn't be there, for leaks. When it detects something, it flags a human pilot." Deyle said the sector is "at the dawn" and poised for expansion, benefiting from the development of low-cost sensors, good wireless connectivity and advances in artificial intelligence. "Everything is coming together" for the robot sector, he said. "We're excited about where this can go." Others in the sector include Colorado-based Gamma 2 Robotics, which aims at warehouses, data centers, manufacturing facilities and retail stores, and California-based SMP Robotics, which makes outdoor robots and is marketing in Brazil, France, Japan, Singapore and the United Arab Emirates. "The economics of these things is becoming cheaper," said JP Gownder, an analyst who follows robotics for Forrester Research. "We're going to see growth of purpose-built robots that can do specific tasks." Gownder said robots offer several advantages over human security guards. "They don't experience security guard fatigue," he said. "Security guard work is challenging because, mentally, very little is happening until it happens. Artificial intelligence can make assessments (on threats) and flag them to a human operator." Steve obviously did that for PR clickbait purposes. Wait til someone spots it pleasuring itself, there will be calls to remove it! This is why the good Lord gave us 5-lb baby sledgehammers and pint bottles of Gorilla Glue. In addition, bots are allowed to indentify as any gender depending on mood. Protocols ver 2.13 proposes gender not limited to physical design or equipment provided. Obviously, Steve had been deliberately tossed into the fountain by the Harbor Center employees. Welcoming Steve to their company with their usual rite of initiation.